His audience of cancer patients helps each other muddle through the songs of their lives, even when they don’t know the next note. I had seen a chemo port before, but never from the perspective of a piano bench. On my first day playing solo in the Dana-Farber Cancer Institute lobby, I noticed a woman, probably in her 40s, leaning back on the couch near the piano. Head tilted back, eyes closed, dozing, she was wearing her shirt open at the neck, exposing the bandaged bump of a port below her right collarbone, where cell-killing chemicals could be infused into a central vein. Over the decades, I have played jazz piano in a variety of venues — fraternity houses smelling of stale beer, restaurants I couldn’t afford to eat in, formal wedding receptions, noisy street fairs — but no job compared to my gig at Dana-Farber, where I could see that improvisation, the flagship of jazz, is not just about music. At age 75, I’m lucky to be visiting weekly as a volunteer piano player and not as a patient. I learned about the gig from a pianist friend who was treated here and now plays at four area hospitals. I’m justifiably modest about my gifts as a pianist, so I jumped at the opportunity to make my music mean something more. Music can soothe, transport, refresh, and, as the drummer Art Blakey used to say, “wash away the dust of everyday life.” I’ve spent uncountable anxious hours worrying about much less serious threats than those endured by my listeners, who have less leeway than the rest of us to defer and deny thoughts of mortality. They inspire me to make the best music I can. The piano sits in a corner of the lower lobby, and its sound carries to the upper level and the second floor. Probably dozens of people, most of them invisible from the bench, make up the audience, but on that first day, I felt that I was playing only for the woman in repose on the couch. It seemed unfair that someone so young had to stare mortality in the face while most of the time, I can look the other way. I took a silent oath to never again bemoan my own aches, pains, and health challenges, a vow I violate almost every day. Like a dissonant chord, I simultaneously resonated with compassion for her and considered myself lucky it hadn’t happened to me. I decided to begin with a classic from the Great American Songbook, one that jazz musicians love to improvise on, “Body and Soul.” As an intro, I played a few lush chords softly. I have heard that one should place a hand gently on a horse before trying to mount it, and, similarly, I didn’t want to startle anyone within earshot of the piano, especially the woman dozing on the couch a few feet away. The melody unfolds like a narrative, a story in musical statements flowing naturally from one to the next. Halfway through the tune, I glanced at the woman on the couch; she had not stirred. I was at ease improvising, creating my own melodic path through familiar territory. It’s far more challenging to improvise on the unfamiliar, as many of these patients and their families are doing, through a terrain, perhaps a minefield, where they must decide which guides to trust. Over the next six months, I had many visitors to the sitting area, but some stand out. 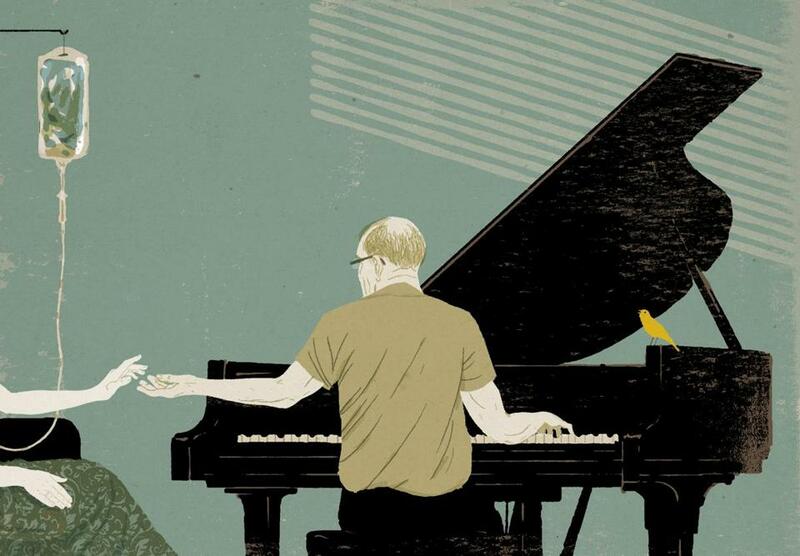 One man came up to the piano, his arm draped tenderly over the shoulder of a woman whose bald head was wrapped in white. She nodded a smiling hello in my direction, and then her husband told me, “God put angels on the Earth, and you are one of them.” I can guarantee that no one who knows me would vouch for that assessment. Anyway, how did the pleasure of playing a mellow Steinway grand in a hospital lobby once a week compare with what this couple must be doing for each other daily? Improvising in tempo is like a downhill slalom, with no do-overs, no second chances. You don’t want to miss a beat, but if you do, the beat goes on. Jazz improvisation is always in real time, minute by minute, without knowing what comes next. In my case, I am not improvising as if my life depends on it. My audience has a far more painful and fearsome song to improvise on than I have ever encountered, one that may require not only playing in time, but playing for time. One afternoon, a woman who had been sitting at the end of the couch nearest to the piano bench asked me to play “As Time Goes By.” The song became an American classic in 1942, in a dramatic scene in the film Casablanca. I can play for hours without propping up a lead sheet on the music stand, but, inexplicably, I had never performed that tune. Embarrassed, I had to admit that I knew snippets of the melody but not enough to play the song through to the end. “I’ll sing it for you,” the woman said cheerily. I knew the opening phrase of the melody, so we started off together. After that, I accompanied her, lagging slightly behind. Another voice joined in — a woman who had been sitting at the other end of the couch working on her laptop. They carried me through to the end of the song, and then I played it again on my own. The vocalists applauded, prompting a few others in the lobby to join them. Our cooperatively performed “As Time Goes By” was no doubt the biggest hit of my first six months on the job. Nothing compares to this gig at the cancer center, where, every day, people are helping others to get through their song when they’re not sure how to play it. Len Lyons teaches jazz appreciation in Newton. Send comments to magazine@globe.com. Get the best of the magazine’s award-winning stories and features right in your e-mail inbox every Sunday. Sign up here.